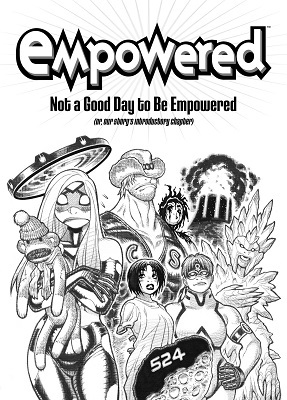 Empowered - "Not a Good Day to Be Empowered"
Empowered volume 9's out, the digital version is too, and the physical one hit the NYT bestseller's list, so it's about time we got an Empowered post! To help push Emp vol 7, Adam Warren is doing some Q&A pages with Ninjette! 'Cause she's taking a major role in this volume. 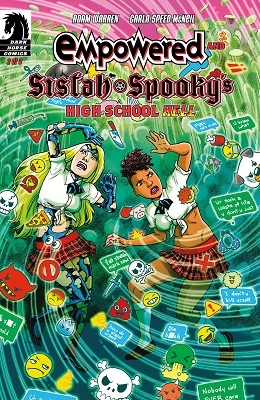 This was an awesome one-shot that brought a smile to my sullen old face during all the reboot misery. It is completely worth your time to look through the "maidman" tag and get to know the character, because he is AWESOME. It's mildly risque due to beefcake and bedroom talk, so possibly NSFW? This is a reconstruction of an earlier post that was lost with the TOSing. 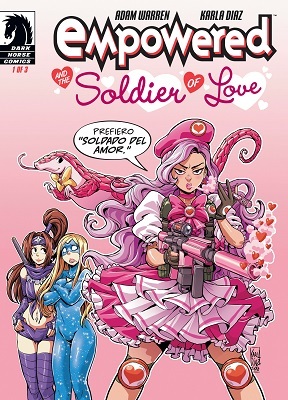 Maidman is a cross dressing Batman analog that started appearing in volume 4 of Empowered. Unlike Batman he seems to love his job and is quite well adjusted (for a cross dressing vigilante with a spit personality). Empowered: "The Wench with a Million Sighs"
In honor of Adam Warren's Empowered one-shot hitting the shelves, let's take a look back at Empowered vol. 4! Eight scans under the cut! For my first post on the new version of Scans Daily, I'm going to give an alert to all the Empowered fans in the audience. 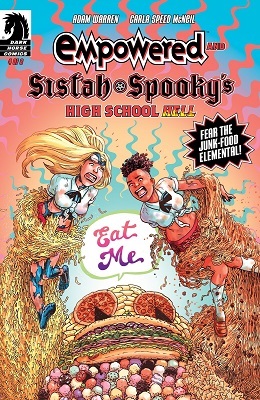 Apparently this week Dark Horse is releasing an Empowered One-shot, and according to Adam it's sales are going to help determine future plans of Empowered, possibly including future releases. So if you're an Empowered fan? Or if you have heard about it and want to check the comic out? Now's a good time. 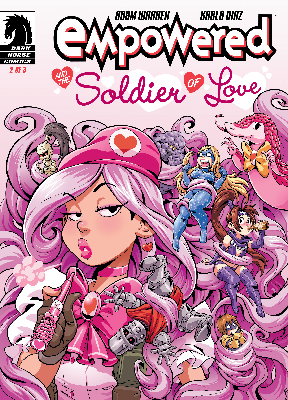 Empowered 5 came out today. Quite good if significantly more subdued than normal. Go out and buy it! I am posting the last page of the volume. Not really a spoiler per-se.